Clouds sometimes appear in strange patterns, one good example is the pileus clouds. This cloud phenomenon has earned high points among cloud spotters. But what makes this cloud so interesting? What role does it play in forecasting the weather? How strange is its cloud pattern? All these and more will be answered in the following paragraphs. Pileus clouds are cloud layers that cap the summit of cumulus and cumulonimbus clouds and sometimes, the stratocumulus clouds. It is an accessory cloud which means that its formation and existence depends on the parent cloud. Pileus is a Latin word for cap which fittingly describes the appearance of a pileus cloud formation which sometimes appears in multiple layers. This cloud is also called “scarf cloud” and “cap cloud” that disappears quickly. They help weather watchers predict thunderstorms because clouds that develop pileus clouds may progress into mature thunderstorm clouds. At What Height is Pileus Clouds Found? Since these clouds appear on top of cumulus and cumulonimbus clouds, they can be found at high elevations, generally anywhere between 20,000 feet and 30,000 feet from the ground. As an accessory cloud, Pileus does not produce rainfall but the parent cloud does. Pileus cloud is largely made up of ice crystals because it develops in the cold region of the troposphere. It is also indicative that there is significant turbulence in the cloud level. How do Pileus Clouds Form? Pileus clouds form when moist air in the cumulus cloud is pushed upwards by strong updrafts inducing the moist air to condense atop the cumulus cloud. It is a strong indication that the main cloud has lots of moisture and is rapidly growing and would eventually become a well-developed thunderstorm cloud. Thus, it is a sign of upcoming severe weather system. Pileus can also be found above mountainsides and volcanic ash clouds. What do Pileus Clouds Look Like? 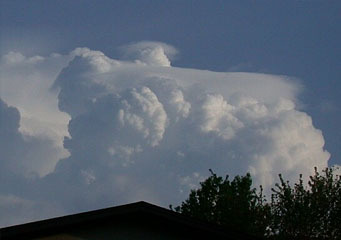 This cloud appears like smooth cap or veil on top of cumulus or cumulonimbus clouds giving it a hood-like appearance. It has earned high collecting points among cloud spotters due to its peculiar manifestation that looks like a bald head with a short life span. Its short existence is due to the fact that the parent cloud may swallow it as a result of vigorous convection below. How common are Pileus Clouds? Pileus clouds are common all over the world except in the polar regions. They tend to frequently appear in mid-latitude regions where severe thunderstorms develop like in the Central Plains of America. Pileus clouds are more than just rare and strange cloud formations. They are visual indications that there is an impending severe weather condition.